This was originally posted in Katgallow. I used the Apple program iBooks Author to create the book. It was the easiest program I’ve ever used. 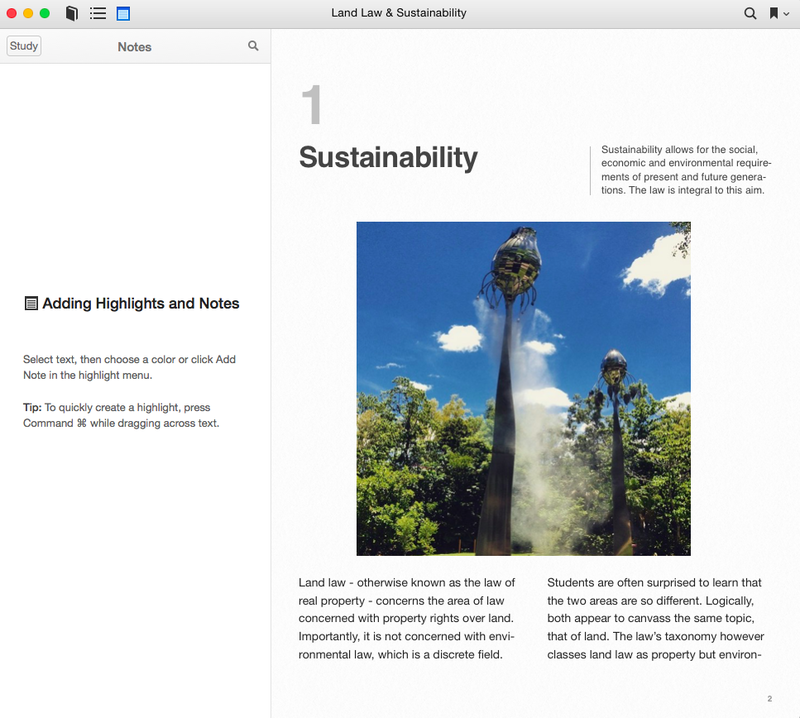 It was intuitive, and took me only a few minutes to create something that actually looked like it might be a book. The layouts were easy to set up and the widgets were on the whole easy to install. I did not take advantage of all widgets – so there is no video or audio clips. I did however install interactive quizzes and slideshows. The entire book is hyperlinked. Because I generally use PowerPoint to make my own slides (and share them on slideshare) I did have to convert them to Keynote to install in the book. The slideshows then have the same function as slideshare does – but embedded within the book itself. 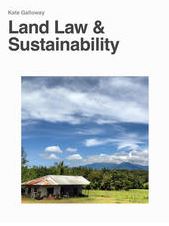 The content of the book is almost directly from the workbooks I provide students taking my subjects Land Law 1 and Land Law 2. Usually I provide word documents on a module by module basis. The book collects all of these together. 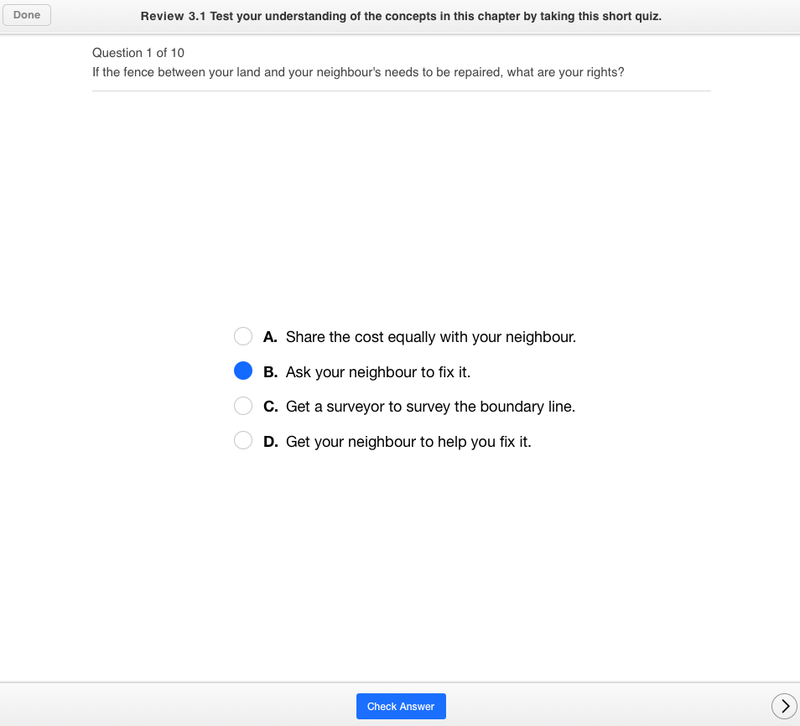 In this format the workbooks include other resources that I normally post on the subject site, such as slides and quizzes. The book therefore becomes an integrated subject resource. Readers of the book can highlight, annotate and share – it will be interesting to see how students engage with the book. My only real issue with this platform of publication is that it is not universally accessible – it can be used only by those with an Apple device. It is possible to upload it as a PDF, making the content universally accessible, but it loses the lovely functionality that is the highlight of the interactive book. My students seemed excited when I released the book – so I will see what they think about its utility in enhancing their learning before I pass the final verdict. This entry was posted in Legal education and tagged digital literacy, learning, legal education. Bookmark the permalink. I don’t own an apple device I could use to view so had to view the book on a friend’s computer. It is just lovely–accessible, interactive, clear and packed with wonderful features. Congratulations! Thank you mazzaus for this great feedback.